From staging a trail-blazing race a century ago to repeated rally triumphs for the KamAZ team, Russian racers have demonstrated that there’s more to this country’s motive power than tired old gags about unreliable Ladas. A big country demands big vehicles, and in Russia that means some monster trucks. KamAZ, based in Nabarezhnaya Chelny in Tatarstan, has built more than 2 million hard-wearing goods vehicles – and since 1991 it’s been a star in the rally world. The company began entering rallies in 1988 but its first big achievement came in 1991 when it attempted the notorious Paris-Dakar race for the first time. Out of 109 vehicles that set off in France, only 44 made it to Senegal – and KamAZ was the only team to get all five of its entrants to the finish line. Semyon Yakubov, one of the drivers, explained how their teamwork made it happen. “Two of our crews were arguing with me, insisting that this was a race and everyone should go all out for victory. These were both famous drivers, national champions … the pressure was intense,” he said. More than that, KamAZ took second and third places in the race, the first successes before a record-breaking run of 12 outright wins between 1996 and 2014. That triumphant run made a national hero of the so-called Tsar of Dakar, Vladimir Chagin, who was on board for seven of those victories. 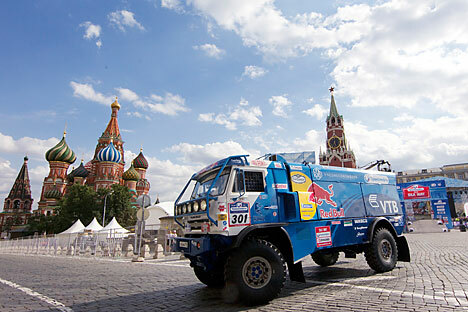 This race, set up as a Russian partner to the Paris-Dakar contest, has only been held for five years. The 2014 edition was postponed to allow Russia to focus more resources on readying Sochi for its F1 debut, but the event is expected to return next year, following a route from Moscow to Astrakhan via the deserts of Kazakhstan. Yakubov was instrumental in establishing the race, which was first contested in 2009 on a route from Kazan in Tatarstan to Ashgabat, the capital of Turkmenistan. This rally also forms part of the extended Dakar series established in 2008 after the original Trans-African route had to be cancelled due to fears of terrorist attacks, reinforcing Russia’s – and KamAZ’s – reputation as a big player on the rally scene. The Silk Way race recalls the early years of Russian auto racing, when the country’s vast expanses – and underdeveloped roads – proved an irresistible challenge to the dashing heroes and heroines of the horseless carriage. Epic road races set out from St. Petersburg to the Black Sea coast, or from the Polish border to the Urals. The Romanovs took an interest: a 1910 rally that formed a circle connecting Petersburg, Kiev and Moscow was sponsored by Tsar Nikolai II. It also attracted an unlikely aristocratic entrant – Princess Sofiya Dolgorukaya. She was the only woman in the race, and would have completed the epic circuit were it not for a radiator failure at Vishny Volochok on the final stage back to Petersburg. While the USSR was keen to promote female athletes, engineers and others willing to tackle traditionally male roles, the first female racing drivers emerged in pre-revolutionary days. Dolgorukaya was not alone: a Madame Suvorina won a winter race from St. Petersburg to Kronstadt and back in 1910 and, along with a Madame Samsova, competed in the 12th and final Volkhonka race in May 1914. That race, just before the first St. Petersburg Grand Prix, proved to be one of the last motorsport events before the First World War, the revolution and the transformation of Russian society. The same historical upheavals mean little is known about the fate of these women, although it is thought that Dolgorukaya may have lived in London for some time after the revolution. The revolution stalled the advance of motor-sport in Russia. While the Soviets were keen on promoting sport and were interested in the technological potential of automotive power there was little enthusiasm for putting the two together. When vehicles were seen at ‘physical culture’ events they tended to be leading parades, bearing flags or giving a ride to performing gymnasts. Sporadic proposals to stage an F1 Grand Prix in Russia first started to emerge in the 1980s and the audience for the biggest Motor Racing series in the world grew rapidly after Budapest brought the race behind the Iron Curtain for the first time in 1986. However, despite a series of proposed routes and venues, it wasn’t until 2010 that Bernie Ecclestone signed a deal to bring the race to a street circuit around Sochi’s Olympic village. By that time Russia already had its first F1 driver, Vitaly Petrov. The Vyborg Rocket got a seat at Renault for two seasons, but never quite manage to harness his undoubted speed and potential into consistent results. Russian fans are unlikely to be able to celebrate a home win in Sochi. Daniil Kvyat, in his debut F1 season, has a best result of ninth place. The Marussia team, owned by a Russian manufacturer but based in Banbury, Oxfordshire, is currently in its third season, it picked up its first ever points in the constructors’ championship when Jules Bianchi came ninth in Monte Carlo. It would be a major shock if there was a Russian presence on the podium in its home GP. The big race in Sochi is the first time the modern-day Formula 1 circus has come to Russia, but it’s far from the first Grand Prix to be staged in the country. On May 18, 1914, in Imperial St. Petersburg, Russia surprised the fledgling motorsport world with its innovative approach to holding a big race. Many features which are taken for granted today, such as purpose-built grandstands for spectators and even prototype race marshals were provided along a 30km course that ran around Pulkovo, Tsarskoye Selo and Ligovo on the outskirts of what was then the Russian capital. However, it failed to attract the biggest teams of the day. Only two factory teams sent a driver, the local Russo-Balt firm and Aquilia Italiana. The Italian, Beria D’Argentina, came in third behind Willy Scholl’s Benz and Sergei Ovsyanikov in a Vauxhall; Russo-Balt’s Ivan Ivanov did not last the course. Having staged a race that impressed the competitors, hopes were high that the following year would see more entries from the big teams. Sadly the outbreak of the First World War ended that dream … until now.